French pianist Pascal Salomon has performed intensively in France, Switzerland, Germany, Spain, Greece, Hungary, Moldova, Romania, Israel, China and USA, both in recitals and chamber music. Some of his solo appearances with orchestra are “Orchestre de la Suisse Romande”, “Sinfonietta” of Lausanne and “La Sinfonietta” de Genève, Orchestre du Capitol (Toulouse), National Chamber Orchestra of Moldova (Chisinau). He taught piano for nine years at the Music Conservatory of Geneva. He gave master classes in Romania (University of Art and College of Music in Iasi), in Hungary (Crescendo Summer Institute of Art), and in China (Yunnan Institute of Arts). Some of the major concert venues: “Ernest Ansermet Studio” Geneva Swiss Radio concert hall (Switzerland), Stravinski Auditorium Montreux (Switzerland), Toulouse Capitole (France), Chisinau Organ Hall (Republic of Moldova), Iasi Philharmonic Hall (Romania), Forbidden City Concert Hall (Beijing-China). 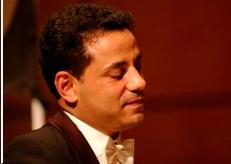 Pascal Salomon has studied at the “Conservatoire National de Musique de Paris” with Gabriel Tacchino. He has taken numerous master classes with the pianists Vera Gornostaeva (professor at the Tchaikovsky Conservatory in Moscow), György Sebök, Andras Schiff, Paul Badura-Skoda, Murray Perahia and Jeremy Denk. He was granted the virtuosity degree at the “Conservatoire Supérieur de Musique de Genève” where he studied with Edson Elias and Nelson Goerner. He obtained a Doctor of Musical Arts degree at University of California Santa Barbara (2017), under the mentorship of Paul Berkowitz and Lee Rothfarb; his research topic was an in-depth study of music phenomenology from a performer’s standpoint.